It’s nearly Christmas! Today I baked some beautiful Christmas bread wreaths inspired by Artisan Bread in Five. 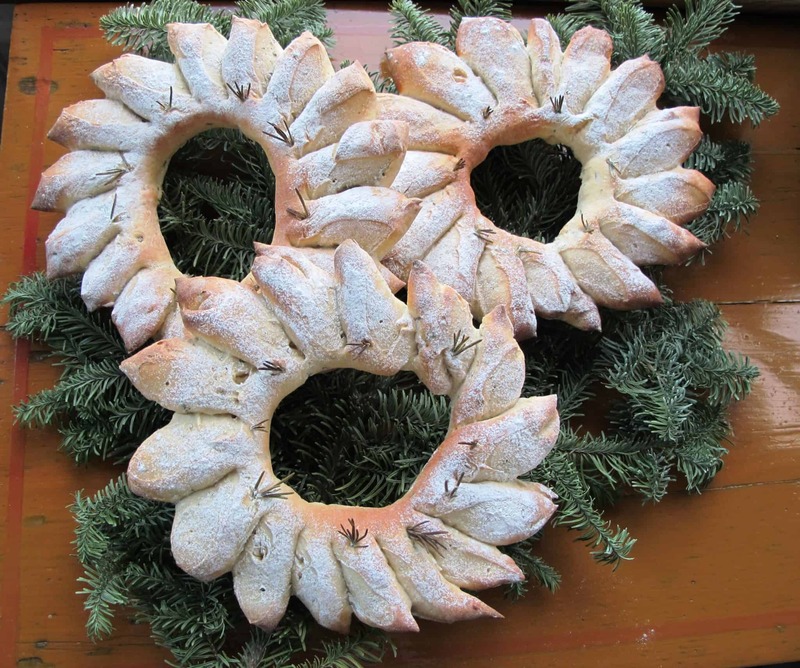 I’ve noted down this easy Christmas bread wreath recipe below. 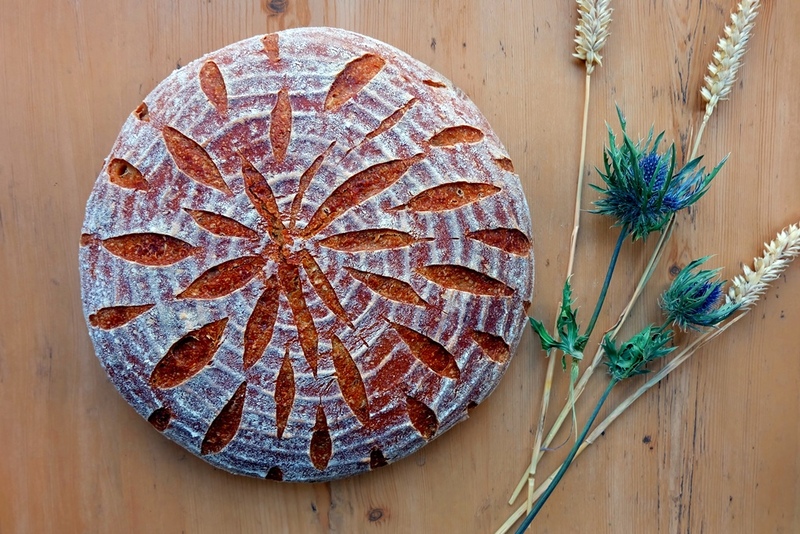 Try it – you’ll be rewarded with some very decorative festive breads. 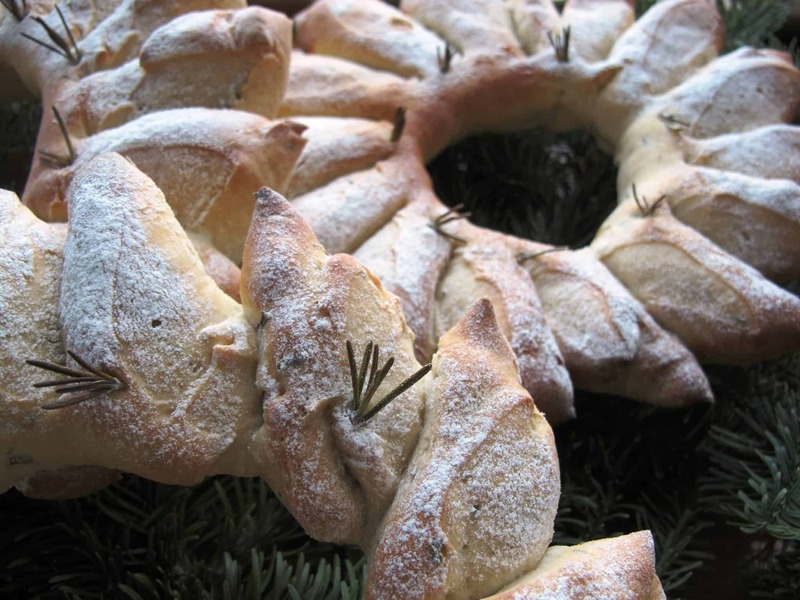 Christmas bread wreath with rosemary – quite a looker! There are also some wonderfully adventurous Christmas bread and baking recipes in Trine Hahnemann’s beautifully presented book ‘Scandinavian Christmas‘. 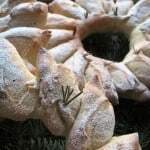 A simple white yeast bread dough is transformed into beautiful wreaths with the help of a pair of kitchen scissors and some rosemary sprigs. Add 200ml of the lukewarm water, the honey, 1 sachet of yeast and 4 tablespoons of flour into a large bowl and mix together with a balloon whisk. Don’t add salt at this stage! Leave to rest in a warm place for about ½ an hour. Add the remaining ingredients to make the dough. Start with the flour, then add half the water followed by the yeast, salt, rosemary, thyme and finally the rest of the water, using a fork to stir initially until the dough starts to combine. Knead for 10 minutes to form an elastic dough. Place in a lightly floured bowl, cover with a clean kitchen towel and leave to rest in a warm, draught-free place until it has doubled in size (approximately an hour). Knock the air out of the dough with your hands. If required - lightly dust the dough to avoid it sticking to your hands. Flatten the dough, then divide into three equal parts. You can use a serrated knife to help with this. Form each part into a roll (approximately 25 cm long), then combine the ends into a ring i.e. the wreath-form. Wet your hands with warm water to help fuse the ends together. Place each wreath on a piece of baking paper and allow to rest for half an hour in a warm place. Lightly dust the dough with flour. Using kitchen scissors make deep cuts into the dough ring. Cut almost to the bottom of the wreath to achieve the desired effect. Carefully place the resulting ‘wedges’ out away from the ring to form points. As it’s Christmas, I used some rosemary sprigs to decorate the wreath and rock salt to garnish the top of the bread wreaths. Slide the ring and the parchment paper right onto the wire rack (or baking stone if you have one) and bake for 25-30 minutes or until golden brown and hollow when tapped at the bottom. An excellent addition to our annual Christmas lunch. We had it with a warming celery, leek and potato soup. Looking and tasting great, merry Christmas!